OK, so before I start, let me just caveat a few things. 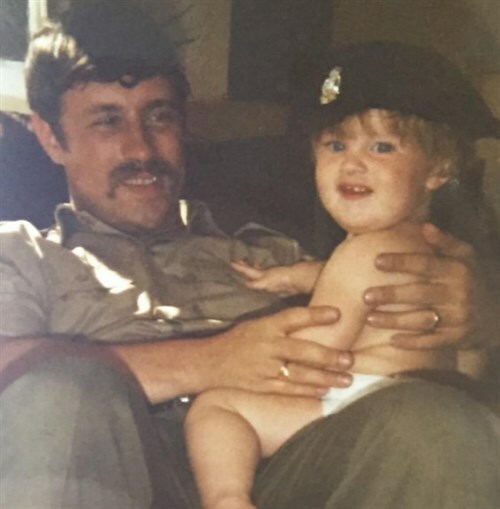 I was brought up by an army dad and He. Loved. Rules. In all honestly, I love rules, too. However, in the crowded world of Search, sometimes blindly following the rules can lead to a lack of creativity and stand-out, and can ultimately impact the results you are able to achieve. This used to be in the Google PPC ad guidelines, but this has now been changed to: “include at least one of your keywords in your ad text”. The example they give is, if you are an advertiser who sells digital cameras, your title should be: “Buy digital cameras”. Inspiring, right? Most people, when writing PPC ads, still default to having the target keyword in the title. But the problem with this is that it makes it really difficult for your ad to stand-out, which can have a negative effect on your CTR. 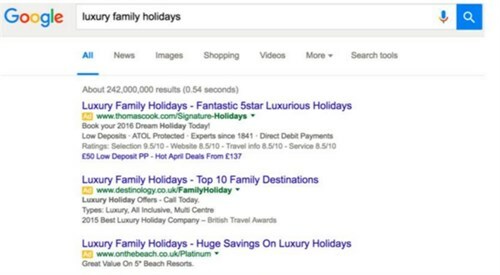 In the example below, every advertiser has led with: “Luxury family holidays” and because they are all saying the same thing, your eyes tend to just skip the start and read the next part of the title. Say something that still shows the users that you offer what they want, but say something different to compel a user to click on your ad over all others. Controversial, I know, but I’m not convinced that taking up valuable characters telling users they can “buy online today” is sensible. “Buy online today”, to stick with that example, takes up 16 characters (including spaces), which equates to almost a quarter of your description allowance. Think about the things you could be saying with those characters which would make you look better than, or different from, your competitors. Would that make users more likely to click on your ad and buy? You won’t know until you try! This concept also goes for your page title. Many marketers will see this simply as a variable to optimise in order to rank in Google, forgetting that the page title becomes your ad title once you rank. With Google taking CTR into account when ranking sites, it’s crucial that this isn’t overlooked. So, try and think about page titles from an SEO and CTR perspective for the best results. The search space is fast moving and dynamic. It’s SO EASY to test, optimise and learn – so try changing your ad text up a bit, going against “best practice”, and see what happens. As long as you monitor results closely and are prepared to pause / change ads quickly, then you have little to lose but potentially a lot to gain.